Are you having a 'Kids Only' table at your wedding? If so -don't put a floral centerpiece on the table - think of something interactive for the kids. Simple would be butcher paper with a bucket of crayons and markers in the center tied with some balloons. or more elaborate - a lollipop cone! 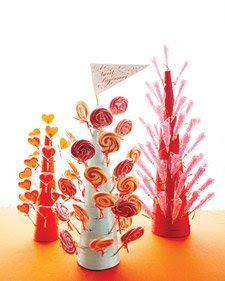 Saw this at Martha Stewart.com - would be easy to recreate with a cone shape, paint, glue and some ribbon. There are instructions here. This would also be great for a candy table at a wedding or at a Kids birthday party. You could use rice krispie treats on a stick or chocolate covered strawberries or something not edible - think of the theme of your party. Maybe I will try this for Gavin's 1st Birthday party - I am still dreaming up the perfect theme! !